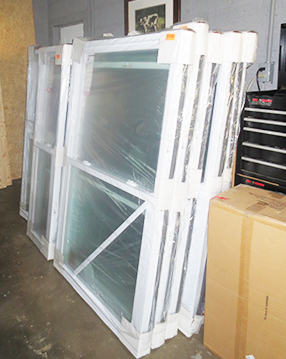 Our new windows are here! Hello lovers! So nice to see you. In the window and door section of our Home Depot they had a brochure stand with a sheet of all the standard window sizes they carried. 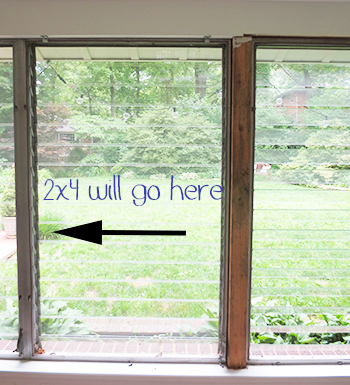 We took one of those home awhile ago and measured to see if the existing windows happened to be a standard size. Cue the sad trombone, they were not. We were prepared for this so Mark took some good measurements of the window openings and we went back to Home Depot to get a quote for custom ones. 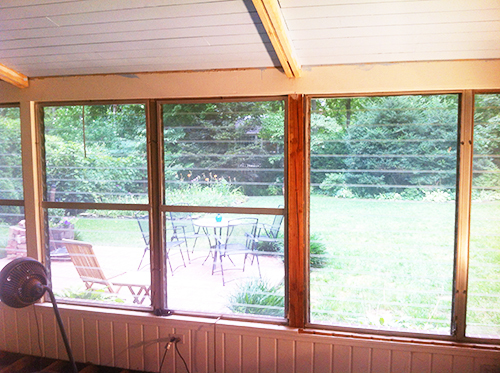 We decided after much thought that we would go with double hung windows. We considered casements as well but Mark was nervous about the additional strain the weight of the window would have on the roof when they were open. Plus double hung is what we have in the rest of the house. Here is what our long run of jalousie windows looks like now. The original quote for the windows and doors was just under $3,000. This is about double what it would have cost if our windows were standard sizes. But again, we were prepared for this and had budgeted and saved $3,000 for the windows so we were just happy it wasn’t more. However, in talking with the sales associate, they told us that we could save a little money by buying two smaller windows instead of one “double window” like we currently have. If you look closely you can see that the middle sets of windows are actually double windows. 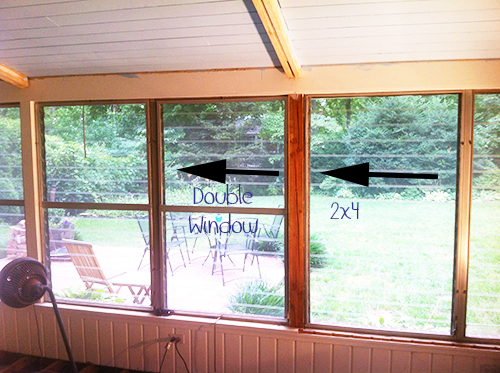 So instead of a double window, we order two smaller windows and we will install a 2×4 in between them, like this. We got the quote at the end of the June and with the 4th of July holiday around the corner, I scoured the Internet for any sales on windows, but I saw none. So the week after the fourth we went in to place our order. We decided beforehand not to order doors at this time as the doors are standard size and we can easily order them later. As the sales associate was totaling up the cost, he told us that we were there on the last day of a sale. We got 15% off bringing our total down to just over $1,800 for just the windows. I totally did the happy dance. The sales associate at Home Depot told us that it would take about three weeks for our order to come in, so we were surprised when they called about a week later and told us they were ready. We picked them up about a week later and they are going to hang out in our garage for a while while we work towards getting ready to install them. In theory, we could install them now, but we don’t want to risk putting a 2×4 through one of them, so we plan to wait until most of the construction is completed. Speaking of construction, here’s the deal with that. In my last post I mentioned that we have to demo the rest of the outdoor kitchen before we shore up the floor joists. Well it turns out that we are going to shore up the floor joists before we cover them up with the debris from the kitchen demo. So that’s what’s happening out there right now. Our progress continues to be hampered by fun plans with friends and family, but we’re still plugging along. Right now we are hoping to finish shoring up the floor joists, demoing the kitchen demo and installing the sub floor before the middle of August. Yahoo!